I read an article recently asking the question, "Do Women Have Themselves To Blame for Work-Family Imbalance?" It brought up several key points how we, women, put such high expectations on ourselves and therefore when we are not *perfect* and live up to those expectations than we deem ourselves as a failure in (insert whatever is at hand at the moment). And guilt. We have such GUILT about it. We are essentially our own worse enemy. I can not be perfect at all things to all people. Heck, I can't even be semi perfect at all things for that matter. Now don't get me wrong, just because I had this AHA moment, it does not mean I have become complacent by any means but rather I have come to grips that for me, perfection, is fleeting. I do the best that I can with what I have to work with. I have some good days, some bad days. ....My house is a mess but I got out of bed. .........My kids are fed even if it is just cereal out of the box for breakfast. ...............My husband and I, we bicker but make up. I am done (have been done) with perfection as the end all, be all of my existance. And you can be too! Just let it go. Enjoy your time with your imperfect family, in your messy house, driving your dirty car through the drive thru for dinner. It is not the end of the world if every dinner is not made from scratch. Shh, nobody will even know unless you tell them. But you have food, you have life. That is what matters! Stop trying to keep up with The Jones'. Be the keeper of your life, your family, your GOD how it fits you. One size does not fit all. What works for me, might not work for you. What works for you, might not work for me. Find that happy medium. Help support your family but don't kill yourself trying to do so, that is not going to help anybody. Give your all at work but turn off your brain from work when you step in your front door. Be present at home. Sit down with the kids, read them a book instead of cleaning the kitchen. Throw in a ready made lasagna for dinner so you can converse with your husband/wife instead of slaving over the stove. And stop reading blogs of those that profess to be perfect! This only does more harm than good to your self esteem. In closing, to answer the question, "Can We Really Have It All?" I think we can get pretty close to having it ALL (whatever all is in our own eyes) BUT we will probably have to lower our high expectations a little bit. I am linking this post up to 6WS over at Showmyface.com. Did you figure out what my 6 words are? Then you will be waiting a long time. You are in the drivers seat! Step on the gas! 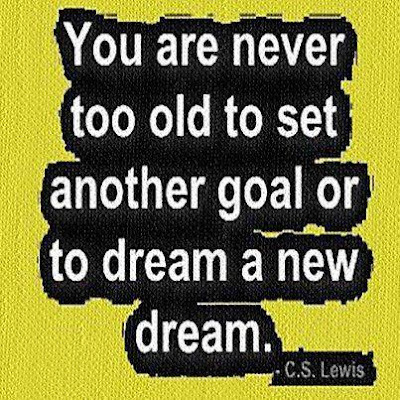 What is your dream, your goals that you have been putting off? And why? Wow, has it really been well over a month since I posted a confessional? That is crazy! No wonder why I have so many faux pas stored up. LOL. 1. I haven't posted a confessional since May 10th! 2. I have only done one blog post this week and it was an insomnia driven post. Yikes! What a slacker. 3. Since we moved, my kitchen sink has often times been buried with dishes. You see, new house is older, so no dishwasher. I know! Acckkkk! But actually, I don't mind washing dishes, when I do wash them, they end up much cleaner most of the time. Key words: when I do them. 4. I didn't even post my menu on MPM this week and have not been very consistent with that either, lately. I still have my plan just don't or didn't post. Maybe next week. 5. Roasted Asparagus is on the menu AGAIN tonight. I think we have eaten Roasted Asparagus every week at some point for the past month. But they are so good, can't help it. Talk about over kill, huh? 6. And chips and salsa with a tad bit of sour cream. Hello! Delish. I can eat that for breakfast, lunch and dinner, but probably shouldn't but maybe did. I am sure there are worse things right? Carbs, veggies, and calcium? 7. Laundry. Barely scratch the surface basket. Too much. Nuff said. Where is my laundry fairy? Ok, enough for now, I am really feeling inadequate as a wife, mother, cook. I have to go now. Actually, I have been thinking about setting up a blog hop type linky for confessional type posts because I KNOW we all have those moments, days, weeks, months where everything is just, just, just, so overwhelming and wouldn't it be great to confess in company? We will support you through thick piles of laundry, burned dinners, forgotten kids at summer camp, a thin wallet because you didn't balance your check book right (although who does that these days?).... You name it, one of us has probably done it once a million times. What do you think? Would you link up? Yep, here I sit 142am, wide awake. Stepping and tripping on a transformer on your way to the bathroom I guess will do that for you. So yep, here I sit bright eyed and bushy tailed. Checking the weather for a few places this next week. I want to go somewhere fun with no rain. Not looking very promising. I think I ate way to many carbs and sugar last night at the church potluck and cake auction. I was so tired by 9pm, crashed and burned. And now, up. Funny story about the cake auction, we won the bid on some cupcakes, not intentionally mind you, I know for a good cause (raising money to send kids to summer camp), but even so didn't intend on bidding on them. You see my husband was on one side of the room, waving his hands to get my attention and our Pastor Mike, caught him and well, SOLD! First thing Mike said 2x at the beginning of the auction, if you so much touch your head, pick your nose, any movements of the arms to the upper area of your body, you will be in the bidding. Ha! He wasn't kidding. Luckily, we were also able to walk away with a lovely Cherry Cheesecake, intentionally. The kids did a fantastic job! Maybe I should be cleaning instead of blogging. Maybe not because then everyone will be up. Not good. Tyler has another basketball camp this week. Thank goodness for grandma and grandpa dropping/picking up. We went and saw our nephew this weekend down in Salem. One word: ADORABLE. Two words: Sooooo Cute. He was asleep most of the time and he was making these cute little snoring sounds the whole time. He did open his eyes for a little bit so we did get a few good pictures of him. Love him! I'm getting sleepy now but I have to be up in less than 3 hours to go to work. What to do. Stay up or try and go back to sleep for a little bit longer. I think I am going to try and go back to sleep otherwise I will be a walking zombie at work. And work this week going to be busy, busy so I think I better try and get my rest. Night, night, sleep tight, don't let the bed bugs bite. 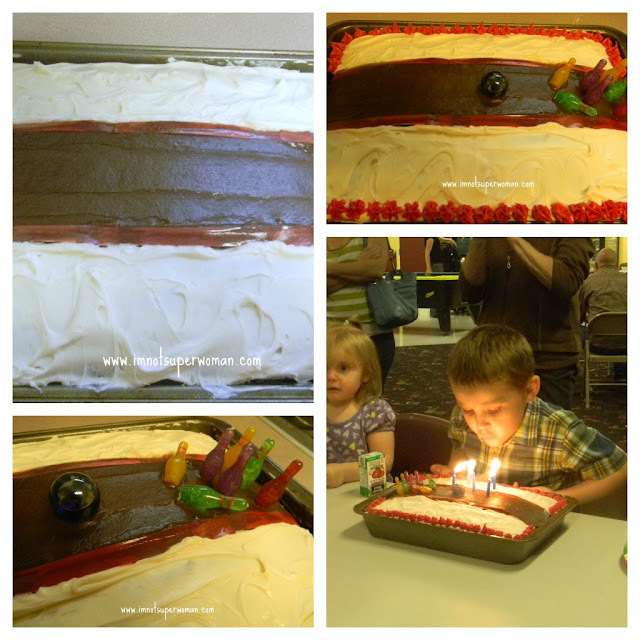 This past week we celebrated Hayden's 5th Birthday. On Saturday, we had a small party with a few of his friends at a local bowling alley. Bumpers abound and barely breaking 100, they all had a great time. In light of the bowling theme, my *creative* side got the best of me. I actually baked a cake and decorated it with a bowling theme. If I must say so myself, I thought it came out rather cute (toot-toot). And the best part of it is it literally only cost me $6.00 (the main ingredients for the cake not included because items are already in my pantry)! I bought the frosting, fruit by the foot, bowling ball/pins decorations, sprinkles, and frosting writing pen at Dollar Tree. 1. Preheat oven to 350 degrees F (175 degrees C). Grease and flour a 13x9 inch pan. 2. In a medium bowl, cream together the sugar and butter. Beat in the eggs, one at a time, then stir in the vanilla. Combine flour and baking powder, add to the creamed mixture and mix well. Finally stir in the milk until batter is smooth along with sprinkles. Pour or spoon batter into the prepared pan. 3. Bake for 30 to 40 minutes in the preheated oven. 4. Insert toothpick in center of cake. If toothpick comes out clean, cake is done. 5. Cool for several hours. (I cooled overnight). 6. Once the cake cooled, take your chocolate frosting and create a strip down the center of the cake, leaving about 4 inches on each side. This is your bowling lane. 7. Slice the fruit by the foot into small strips and lay on each side of the lane as the bumpers. 8. 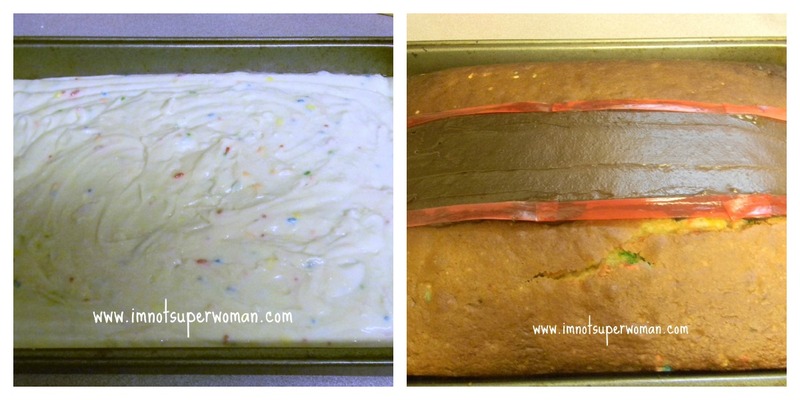 Take the vanilla frosting and frost the remaining area of cake. 9. Add stars around edge with the writing pen using the star tip. 10. Add the bowling ball and pins in the lane. I thought about making a second cake because our church is having a cake auction this evening BUT I have something else up my sleeve instead. You will have to visit again real soon to check it out. House rules list. Still working on it. I know I need to fast track that baby. I need something though in the interim. I've resorted to Post It Notes. to link this post﻿ to Cate at Show My Face for 6WS. What's that you asked? I thought you'd never. 6WS is Six Word Saturday. what is goin' on in YOUR world in 6 words. So here are the post its that I am posting around our house. I knew you would catch on. There is so much more where these come from. OCD? Maybe just a little bit. 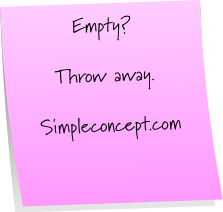 Hey, you want some of your own post it notes? Go here. Have a Happy Friday or Saturday depending on when you read this. 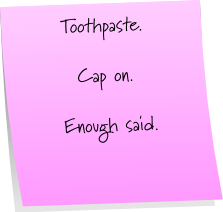 What do your post it notes say? Do tell. Am I being too harsh? It's a fact I am aging. No beating around the bush around here. It is what it is. I can not turn back time (nor can Cher). However that doesn't mean that I am ok with aging and I won't go down kicking and screaming. I will still try to trick my skin any chance I can get. It used to be so supple, soft, radiant. Now, the crows feet are evident, the age spots are sprouting up and those laugh lines, I'm not laughing anymore about those. Over the past couple years I have tried many anti aging products. You know the ones the stars are hawking (who don't really need it anwyays not to mention cost an arm and a leg) or the next big thing on QVC. Yeah, I was the *one* person that bought that. I have recently been given the opportunity to try a new beauty line which rejeventates your skin cells to help stimulate your aging skin so it looks like much younger skin. And because it is plant-based I figured why not since I am a vegetarian. There is new hope for aging skin with the éclos Skin Care line of products. éclos Skin Care contains a high potency of plant stem cells from a rare swiss apple and clinical results show 100% of subjects experienced visible decrease in wrinkle depth. I have seen it first hand in my own skin. I have been using it for almost 3 weeks now. My skin is soft, supple and those laugh lines not as defined and even the crows feet they are softer. And my skin is just glowing. You would think I was with child. Skin Prep Facial Cleanser; good for all skin types. Instant Radiance Facial Scrub used to polish away dry flaky skin. Moisure Therapy Regenerative Cream which promotes the self renewal of skin cells. Cellular Activator Face Serum awakens tired skin cells and helps reduce appearance of wrinkles. Skin Renewal Clay Mask is a multifunctional mask used to unclog pores while restoring your skin to your youthful prime condition. One lucky reader of my blog will be able to try this product first hand and see the amazing results with their own eyes. Please leave a comment on this blog post telling me what product in the kit you would be most excited to try. One lucky commenter will be selected randomly to win a éclos Skin Care plant-based beauty kit (a $40.00 value). Please make sure to comment with your blog handle or leave an email address so I can contact you should you win. Once again it has been one of those weeks. I thought I knew the answers to every things and figured it all out but alas no luck. A bit discouraging. I applied for an upcoming mission trip with a very well known agency and unfortunately, I didn't make the cut this time around. Discouraging yet uplifting because I know that the timing was obviously not right and there is still work to be done to put me in the place that I need to be for something that big. Not to mention I received a lovely email from one of the well known coordinators who had nothing but good things to say and who wants to continue dialogue and perhaps I can get into one of the upcoming trips. So that is what I shall do. In the mean time, another opportunity may be creeping up upon us which I am thrilled about. A few members of our church are founding members of an orphanage in Mexico and every now and again they take a team down to help out with projects and to work with the children. A team recently returned from there which included my friend Jill. They are hoping to get another team scheduled to go down there in the next few months and that team will *hopefully* include either my husband or myself. I am so excited however it works out. Just as long as one of us can go down there to help and share the love that these children so desperately need. 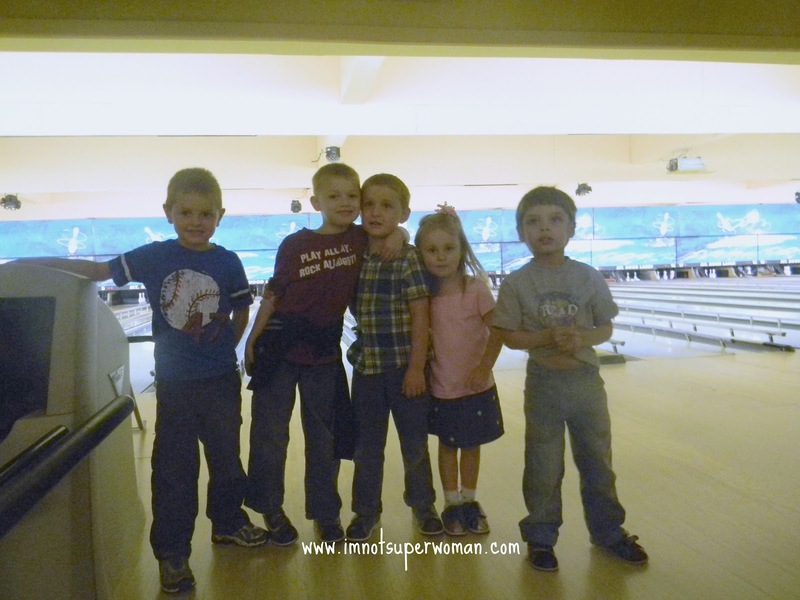 We have a bowling party tomorrow for our 5 year old (his birthday was on Monday). I am making a bowling themed cake tonight. Crossing my fingers it comes out the way I envisioned. I am not much of a baker, not that I can't bake, it just isn't something I am totally excited about. I will share some pictures with you tomorrow. On Sunday we have church potluck and cake auction. I am making a SW Tator Tot bake, Thai Cole Slaw and some really cool Rice Crispy Treat Ice Cream Cones. I will share recipes and pictures of these as well hopefully early next week. I have a couple giveaways coming up. So make sure to check back in with me shortly. How about the "sprinkler" and "churning the butter". And can't forget the "running man". And who is that man in the Army uniform? I think I know him. Dave, is that you? In case you missed it. This was on my Menu Plan Monday for this past Sunday night. 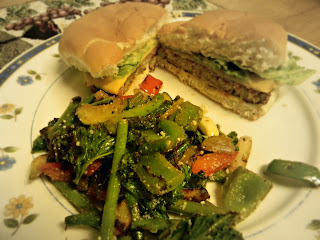 We had these *AHHHSOME* grilled mixed vegetables along with our Morning Star Veggie Burgers and Chips. Can I just say they were the best mixed veggies evahhhh. Really they were. I honestly have never grilled many of these vegetables together let alone on a actual grill. I am so sorry I have been missing all this yummyness. 2. Add olive oil, mix. Add enough to lightly cover vegetables but do not over saturate. 3. Cook on grill for 15-20 minutes, constantly turn with spatula so they don't burn. 4. A good indicator that the items are well cooked is to put a fork in a piece of asparagus. If soft, then most other vegetables should be done as well. 7. Sprinkle Parmesan Cheese onto vegetables, mix. I am linking this up with Not Just A Houswife and 33 Shades of Green Tasty Tuesdays! Time for the big P-training in P-town. Potty over here, potty over there. LOL. In all seriousness, Kaylyn, definitely seems ready to start the potty training business. She knows when she is wet or has had a poopy. She does not like to be in it for very long to the point that she takes her diapers off, often, throughout the day. It's no wonder we have been going through diapers like she is a new born. With that being said, this next week/weekend, we are going to work on potty training. I am hoping and praying that she will be as easy as the other children were. No real struggles with any of them. It was almost like one day each of them woke up and said "Ok, I am ready to use the big potty." Of course we know it really wasn't that easy...but I can pretend, right? I think my biggest fear of the whole potty training business is when we are out in public; using public restrooms. 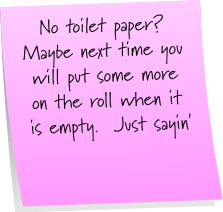 (I know *they* say when you potty train you should stay home for a few days, therefore no need for public pottys however in our busy household, not an option). But back to public restrooms; they are high on my gross factor. I don't even like using public restrooms and here I have to throw my child to the wolves by having to sit on a public toilet seat. Ick! And since I can not carry around our potty chair or potty seat I have found an alternative that I can easily carry in a diaper bag or even my purse. With a disposable Potty Cover I know we will always be covered (pun intended) when we are visiting a public restroom for the up tenth time. 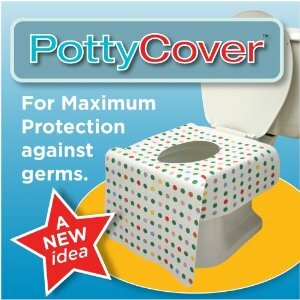 The Potty Cover is made of soft non-woven fabric on top with plastic on the bottom to create a water proof barrier. And it is one of the largest Potty Cover covers on the market whereas it covers the front and sides of the toilet to keep away the germs and wetness left behind. And no chance for your little ones pants to get wet from the front of the toilet either. Look at the large flap of material that hangs over to protect. Many of the other toilet seat covers, cover only a fraction of the toilet seat leaving areas for little hands to easily touch the dirty toilets (I know gross visual). This not only offers some of the best coverage but they are also very reasonably priced as well. They are not the cheapest nor the most expensive but well worth it. You can find The Potty Cover on ebay, Amazon, BuyBabyBuy and select BedBathandBeyond Stores. I am finally posting a MPM again and linking up with I'm An Organized Junkie. We are still going strong on the vegetarian meals. My husband occasionally will eat meat when we are out at a restaurant but I have been holding strong. All meals that I make at home are vegetarian. I am still feeling absolutely wonderful. My skin is looking fresh and clean (although that also might have something to do with a new plant based skin care product (s) that I have been using and will write about in a later post). My digestion system I know is thanking me these days, too. I have been even considering doing a juice detox to step it up a notch. What are you cookin' this week? Any great vegetarian recipes you would like to share? *Check back for the recipe for the *best* grilled vegetables I have evah eaten. Today is Hayden's 5th Birthday. blessed with a bouncing baby boy. He came into the world just shy of his older sisters birthday, hooting and hollaring. TV that everyone was watching in the waiting area next door. And I mean everyone was watching it including our doctor. (That is a whole other blog post). Hayden you are the cheese to my macaroni. You make me smile just thinking about you. You have grown into such a sweet kid. So loving, compassionate, giving, godly, inquisitive. A bundle of joy and energy. Happy 5th Birthday Hayden Elijah! I have probably said this a thousand times on this blog (ok, maybe not that many times) but I AM not perfect (I know shocker, lol); nor am I Superwoman. WE are not perfect. There is only one that is perfect. HIM. Why is it that so many people then profess to be just that, *perfect*, in all that they do? And then some even have the audacity to judge others because of it? As a loud and proud Christian I find it so hypocritical when others that call themselves Christians, yet judge others so easily and openly. :::WE should be there for one another. :::WE should be encouraging one another. :::WE should be advocating for one another. :::WE should be praying for one another. This is hard for me to say but I KNOW why so many people have issues with religion, not one religion over another, but religion in general....so often there is so much hypocrisy. I see it. I hear it. :::They don't have the perfect family. What's that? Is there such a thing? :::They are not the perfect parent. Kids don't come with manuals. Live and learn. :::They do not have the perfect child. EVERY child is perfect and a blessing. :::They are not the perfect homemaker. So what if we don't always cook from scratch and you can't eat off our floors. :::They are not the perfect wife or husband. Really, who is? We live. We disagree. We, god forbide, get angry at one another sometimes over something we are passionate about, that we believe in. We laugh. We kiss. We hug. We love. Repeat. We do the best we can with what we have to work with and that is all that can be asked of us. Do we flounder, do we lose hope at times, do we want to throw up our hands sometimes, of course! But my point of this rant is, the times that you should feel the safest and the least judged is when you are with your sisters and brothers in Christ in the house of the LORD yet some don't and that, right their folks, makes me angry! On a lighter note, the sun is shining brightly, it is Friday and we are ALIVE! We are truly blessed anyway you look at it. It has been a rough couple days. 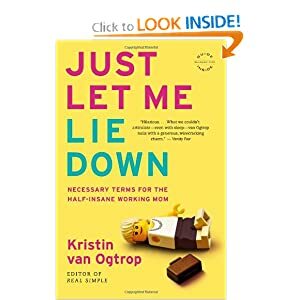 I can't put my finger on the cause but between work, home, kids, end of school year, the list can go on and on...I have been feeling all out of sorts. A bit overwhelmed even. Scatterbrain. Walking in a fog....You get the picture. But now, all is well! (Still a bit scatterbrain and foggy BUT everything else has been put in perspective). It started out with a middle of the night facebook post (last night) from my BIL that they were headed to the hospital to have their little boy. He is a couple days overdue so we were all getting a little impatient. And then I checked my email and what was awaiting me but a very nice email from a blogging friend who was emailing to let me know she received my note and trinket that I mailed her a couple weeks prior. I subsequently then visited a few of my favorite blogs including hers to be surprised by a wonderful blog post that MADE.MY.DAY. My week. That was just the icing on the cake of what turned out to be an awesome day. Our newest family member was finally born at 553pm yesterday and weighed in at 8lbs 15ozs. Welcome to the world Liam. I know you are going to do great things! And to my BIL Jeff and his wife Lydia, you did good, you did good! May God continue to guide you, your marriage and the raising of your son. Funny how a birth of a child can put so many things in perspective, in an instant, and that along with other things i.e. receiving a nice email or reading that blog post that hits home, happens at just the perfect time. Apparently, my card and trinket that I sent my faraway friend was received at just the precise moment that she needed it the most. Little did she know that I needed that email and that wonderful blog post as well. And Liam he was born exactly when he was supposed to be. That my friends is GOD at work. Sometimes we just have to be patient and let him reveal *it* when the timing is right. His timing not ours. It eventually all comes together. 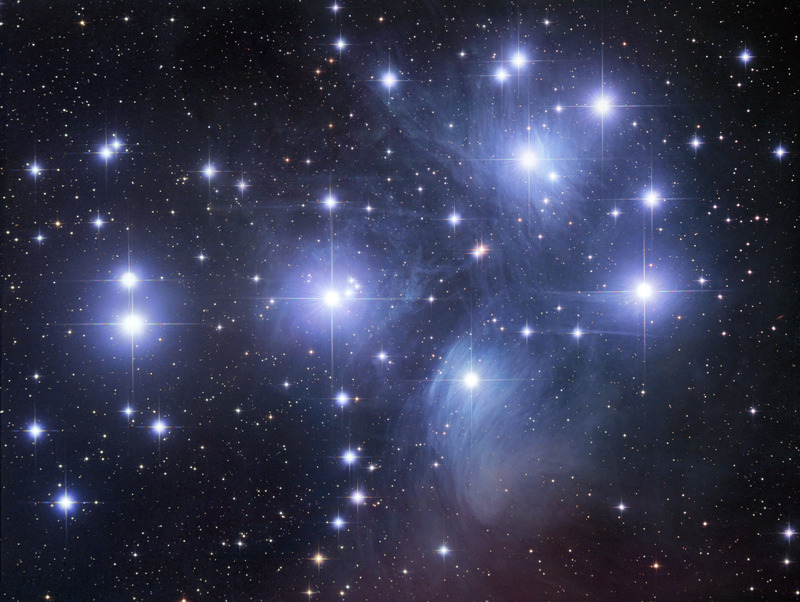 The stars align and all is well in the world once again, it may be only for a fleeting moment but that is all we need to pick ourselves up, dust ourselves off and proceed. To my friend Fi in Australia, thank you for your kind words! One day you, me, our backpacks and Europe! This post is sponsored by Campus Book Rentals. All opinions are 100% mine. I know school just got out for the summer in most areas so you are probably wondering why I am even talking about college. Take a breather, right? No such luck for this mom of a college age student who tends to go year round. My 19 year old daughter is into her second full year of college and has been going every term, including summer, to get a little bit ahead. She finds the summer classes, although they are more condensed, she can take the whole series of classes within the one term. If she took them during during the regular school year she would have to take them term by term. With that in mind there is NO breather from the expenses either. Between per credits costs, lab fees, parking permits (that seem to increase by the day) AND text book costs, it is no wonder we are always broke. LOL. We need to find a way to cut some costs some how when it comes to school and what seems the easiest is the cost of text books. Why buy new when you can rent used. By renting books, from Campus Book Rentals, books that you are most likely only going to use the one term and never see the light of day again, you can save 40%-90% off of book store prices. You can buy Essentials of Entrepreneurship and Small Business Management (6th Edition) by Norman M. Scarborough on that really big online website at the UNBELIEVABLE cost of $139.24! But you can rent this for a semester from Campus Book Rentals for a steal of $41.26! A 70% savings! And with Campus Book Rentals standard shipping is free. You can highlight in the books and the rental time frames are flexible. Plus if you drop the class, order the wrong book, or change your mind, you can return the book within 30 days for a full refund. Risk Free! Ohh and did I mention that they donate a portion of each rental to Operation Smile. The goal this year is to donate enough money for a minimum of 1,000 life changing cleft palate surgeries! Even if I wasn't saving as much money as the examples, this alone would be a big incentive to rent books from them. I always try and do business with companies that give back. At long last I finally got around to making a tutorial on these awesome and easy hanging planters. Instead of paying $10-$15 for those "As Seen On TV" hanging planters (that are now sold in many stores) I made these for a fraction of the cost! 1. Cut 3-4 inches off the bottom of the pop bottle with hand saw. 2. Drill hole on each side of the pop bottle, evenly, to thread your screw through. Fasten with nut. 3. Cut piece of wire to your desired length however do not make it to long. 4. Wrap each end of the wire several times around the screw until it is secure around the screw on each side. 5. Fill pop bottle up about 1/5 with potting soil. 7. 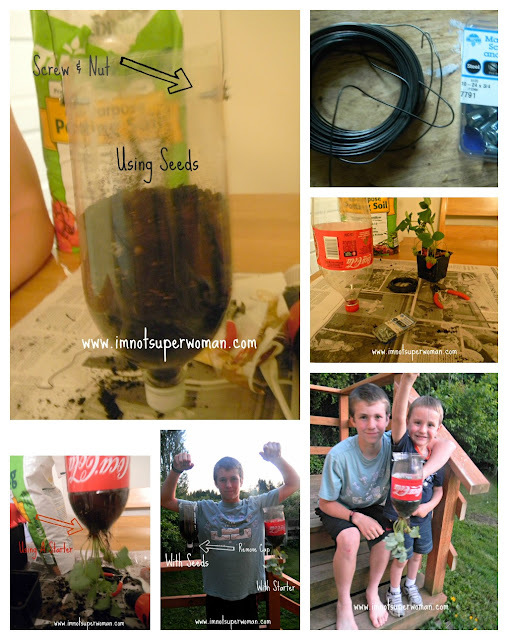 Cover seeds with additional potting soil until about 3/4 of bottle is full of soil. 8. If you are going to plant root plants too, sprinkle the seeds in just shy of the 3/4 of soil and then add a layer of soil on top of seeds. 9. Hang on plant hanger under eaves but where there is good sunlight. *The best types of starter or seeds to use in hanging planters are those that are vine type that typically use smaller growing spaces i.e. cucumber, zucchini, peppers, tomatoes, strawberries, green beans, etc. You can also use some of the upper space with root vegetables such as carrots or radishes. **If you are using a starter you will need to cut a portion of the top of the bottle where the neck is so the opening is a little bit bigger to thread the starter through. In these two planters I planted peppers with seeds and then strawberries with a starter. These took me about 15 minutes from start to finish. Very simple project that even those with a black thumb can do. Let me know if you decide to make one of these and what you end up planting. I have linked this DIY project at Nifty Thrifty Things, Thrifty 101, Shabby Nest and Not Just A Housewife. Several years back I had the opportunity to go to Pennsylvania. It was a quick trip and I was to young to really appreciate anything. I remember driving through the area seeing Amish country with the buggies driving along the side of the rode. Unfortunately for Pennsylvania, this is pretty much the the vision that stuck with me for many years. Now of course as an adult I know there is so much more to Pennsylvania. Pennsylvania offers romantic getaways for the lover in you, historic landmarks, amusement parks for family thrills, and so much more. With the pa-roadtrips Roadtrip-A-Matic, you can plan your trip quickly and start packing. Whatever trip you are looking for chances are you can find it here. Where to stay, what to see, what to eat. It is all taken care of with a click of a mouse. If I had the chance to go again I would surely take my family and go in the fall when most kids are back in school. And because we have a couple small children we would have to do something entertaining for them like the Kidsylvania Road trip. Take in the zoo, aquarium and a few musuems for teachable moments. The possibilites are endless. Whatever you fancy, Pennsylvania roadtrips offers it. Start packing now and head on out on the open road. Who would you take and what would you do? Time for another round of What I'm Lovin with your host Jennifer! That's me. I started reading it recently, picked it up for super cheap and so far it has not let me down...Nor Let Me Lie It Down. LOL. It is right on the mark. I am working on a review/giveaway for this so stay tuned. What are you lovin' this week? Any great products, recipes, pictures, you want to share? I wrote about this not to long ago but wanted to share it again. I exchanged several emails a couple months back with a writer from Parenting Magazine/Disneybaby.com about New Mommy Mantras and welllllll....she used some of my stuff. Might not mean much to you but I think it is pretty neat. What is your live by Mommy Mantra? Not sure why I can't sleep these last couple nights very well. But I can't so here I sit...pounding out a blog post at 130am in the morning because there really is nothing else to do in the middle of the night round these parts. 1. It took forever to get the kiddos to calm down and go to sleep tonight. Why oh why? 2. Popcorn. No more. I am tired of having to vacuum half of it up. Does anyone else have this problem? 3. I failed this week with our menu plan. Because of my lack of sleep twice I didn't make a full on meal for dinner just made something quick n easy for the kids and I snacked on veggies. This mom was/is tired. 4. My husband is going to a Dodgers game on Saturday in Seattle. He is beyond excited. This is all he has talked about since he got the ticket a few weeks ago. I hope he has fun but it is going to be a long day with just me and the kiddos. 5. I am really praying it doesn't rain all weekend. I really need to get our garden going. I have several starters that need to be planted. 6. 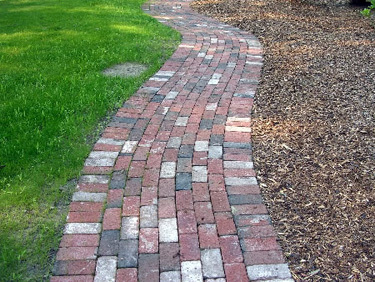 We are putting a brick walkway from our driveway leading up to our front door and we need to do that as well on Sunday (weather permitting). I will post before and after pictures, hopefully. Here is what my vision is. Nothing to fancy but nice. 7. I still need to get curtains/rods for our living room windows. Glad we don't live in a neighborhood otherwise this would have been top priority. Since we live somewhat in the country, the likelihood that someone is peeking in our windows, very slim. 8. Our car insurance rates skyrocketed. Ouch. Thank you to our lovely daughter for getting in two car accidents within a month of each other. She is alright so that is all that matters but still. 9. Our neighbors horses have grown very fond of us. We whistle and they come running. We love feeding them carrots and apples. 10. My phone. It has pretty much died. That is all I have to say about that. 11. I think I am getting sleepy now. I am going to try to go back to sleep. I have to get up in 3 hours to start my day. Go. Go. Go. That is my life these days. Early morning wake up calls, to work, pick up kids, running errands, to basketball practice, games...Always doing something, going somewhere. Within this hectic life I call mine, I try to eat a well balanced diet, which of course is not always easy but when I find things like the Quaker Soft Baked Bar, it makes being on the go, tolerable. I throw one of these in my purse for a breakfast snack or leave it in there and eat it for my 2pm pick me up. OR sometimes the kiddos sneak and eat it. Those little rascals. I don't mind though because it is made with wholesome food of real fruits and nuts. It is packed with 5g of fiber and 6g of protein so it gives you the needed fuel to continue on with your day. And it is only 140 calories so guilt free! It comes in two flavors: Banana Nut Bread and Cinnamon Pecan Bread. I am a sucker for the Banana Nut Bread one. Heat it up and it is like a loaf of warm banana bread just out of the oven (without the mess). Gotta love that. Try'em I bet you will like them. Available at your local grocery store in the cereal section. In case you didn't remember...Father's Day is just around the corner, Sunday, June 17th. The right Father's Day card does more than tell your dad you remembered - it shows him how much he means to you and how much you care. Since your dad is truly one-of-a-kind, create a FREE personalized Father's Day Card and make it as unique as they are. Remember all the little sayings he used to say: "Don't make me stop the car!" and "Close the door, were you born in a barn?". Or you can share your favorite heartwarming memories like how Dad taught you how to tie your shoes (remember bunny ears, loop and scoop) and that look in his eyes that said "My little girl is all grown up, whether I like it or not" when he walked you down the aisle. Cardstore.com's wide variety of Father's Day cards let you make a unique statement beyond just "Happy Father's Day". It's easy to get started. Just choose a modern or funny Father's Day card, add your own sayings, memories, photos, and even your own signature, and remind Dad how important he is to you. It's just like sending a little you! 1 FREE Dad Card + FREE Shipping valid through Friday, 6/8. Free Card valid in the US and Canada only. Use Code: LUVDAD2 at checkout for a limited time. Hurry Shop Now! Note: Free Shipping only available in the US. One Free Card redemption per Cardstore.com account. You must use the links provided in order to receive the free card bonus. **This post includes affiliate links. I was reading one of my favorite blogs today, Inspiration To Dream, by Fi from over in the Down Under and she was quite terse in her words about people judging others, judging others anonymously especially which I agree is the most cowardly of acts in the blogosphere. Speaking from first hand experience, I know when I have been 150% authentic in my posts about my dreams, my passions, the direction in life our family is going, etc, I have received some not so nice comments i.e. judged. I think that right there is the reason why so many people in the blogosphere are not TRULY authentic. So often we (including me at times) are in fear of ruffling feathers, stepping on someones *fingers*, offending someone and I say ENOUGH is ENOUGH. If you are brave enough to have a blog, putting yourself out there for ridicule, BE WHO YOU ARE, without the fear; it is YOUR blog! You make the rules. Like I have said a few times to the people that have left unpleasant comments, if you don't like what I am writing about, if you don't agree, fine, but you don't have to be a jerk about it. The solution is simple: DON'T read my blog. Turn off the computer and move along. Even with critics, I, for one, will continue to blog about the good, the bad and the ugly of our lives trials and tribulations because that is WHO I am and I can not be anybody other than that. With that in mind, the blogs that I follow and comment on regularly are similar as well. The people are real, their stories are sometimes very raw, they live and love life even with the ups and downs. Be true to you! That is what really matters in the end. Better late than never. Shortly after Kaylyn's 2nd birthday (May 5th), we moved so time just got away from me. But I am catching up now so here you go. How bout those cupcakes! Pretty cool, huh? They were flowers and butterflies. Made by one of my besties, Shannon. She does such an awesome job! I will have to show you some more of her work in a couple weeks after our cake auction. Like how she is eating the cake. Forget the fork. LOL. She was a mess. 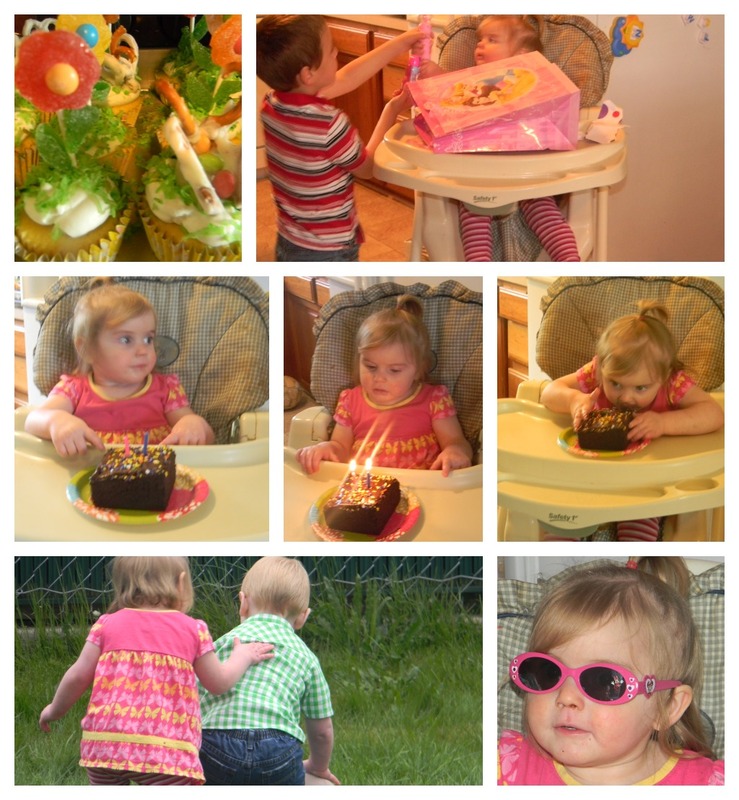 You can still see the cake up her nostril in the picture of her with the sun glasses. She is a ROCKSTAR! And the little boy that Kaylyn is so lovingly touching is her cousin, Bradlee. He is 18 months. They are pals. .....Why is it when I buy tin foil does it take the kids 1.2 seconds to open and unravel half of it? .....Why is it that when Rose Festival comes every year in Portland does the weather turn to mush. Rain, Rain, Go Away! .....Why when there a huge DRY parking lot do your children head in the direction of the ONE puddle? .....Why when I have the opportunity to take a nap, I can't sleep? .....Why do the kids want to play with everything BUT their toys? .....Why when I am not in a shopping mood, do I find the best things? ......Why do I find the best things, when I have the least money? .....Why does Hayden want to play *drums* on everything but his *drums*? A lot of these I can probably chalk up to Murphy and his darn Law. LOL. Who is Murphy and what does he know anyways? Good morning Monday! It is going to be a great week. I can feel it. 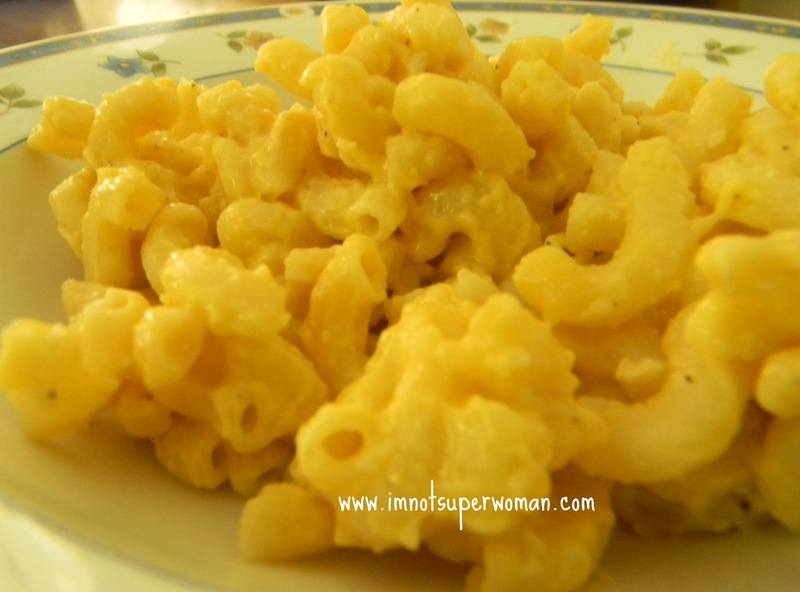 I am linking up with Menu Plan Monday at I'm An Organizing Junkie to share what we are eating this week and will be lurking around looking at others plans as well. Join me? This week marks a milestone in our house. 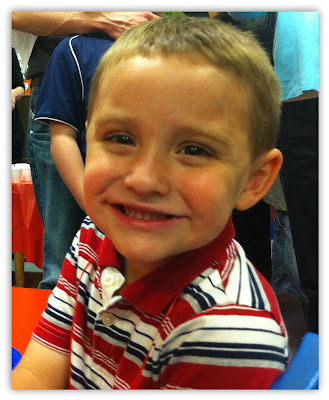 Our 4 year old, almost 5 year old, graduated from preschool on Wednesday night. Exciting, yet bittersweet. Our littlest boy is growing up and will be in kindergarten in the fall. My how time has flown since the day he was born. I remember the day we brought him home like it was yesterday. It was a warm June day in 2007, he just 2 days old. Wrinkly, pale, and so tiny. He was so tiny; I didn't remember that the other two older ones were ever that tiny but I am sure they were. Daddy could literally hold his head in the palm of his hand while the rest of his cute tiny baby body laid on his forearm. Those first nights at home, I could barely sleep not because he was waking up often, he actually was a pretty good sleeper but because I was a nervous mom. It was as if I was a first time mom but I wasn't, it had been 9 years since I had a baby so times had changed. I had changed. I was now a mother of 3, another little boy to nurture and love and teach how to be a god loving, good man (someday). I know he is only 4 so there is alot more nurturing and loving and teaching to be done but so far, he is everything that I have hoped he would be. 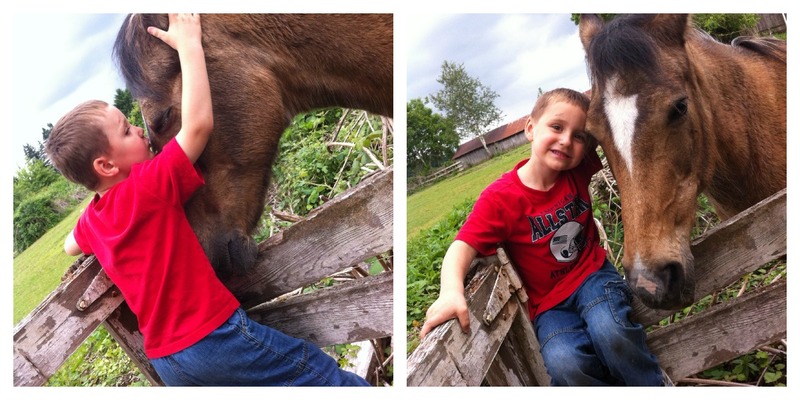 He is the sweetest, most adventurous, inquisitive 4 year old. He questions everything. Dotes on his little sister. Follows his big brother around like he is his shadow. He loves life and playing outside til he wears himself out silly. He loves his mom and dad and tells us often. He loves his Grandma D and uncles. He is a snuggle bug and can't get enough of Calliou (the only cartoon he will actually watch). Even when he is the most onery, he is still the cutest and sweetest little boy. His crooked little smile and dimples just melt my heart. Congratulations Mr.Hayden! Mommy and Daddy love you, sweet boy! We are so proud of you and the little boy you have become. Here is to many more adventurous wonderful years with you!